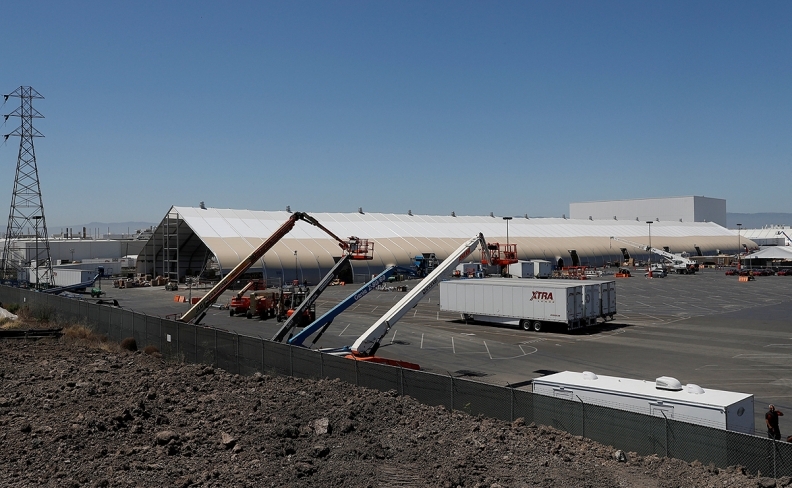 As the end of the quarter neared, Musk spurred on workers, built a new assembly line in a huge tent outside the main factory. SAN FRANCISCO -- Tesla Inc. reached a milestone critical to Elon Musk’s goal to bring electric cars to the masses -- and earn some profit in the process -- by finally exceeding a long-sought production target with the Model 3. By building more than 5,000 of the sedans in the last week of the second quarter, Tesla “just became a real car company,” the CEO said in an internal email Sunday obtained by Bloomberg News. The 47-year-old Musk said he celebrated his birthday earlier this week at the factory, where he had been posting photographs of drive units and the paint shop to his social media accounts. But it was unclear when exactly Tesla hit the milestone. Two workers at the plant told Reuters the 5000th unit of the week actually rolled off the assembly line on Sunday morning, several hours after Musk's midnight goal. The 5,000th car finished final quality checks at the Fremont, Calif., factory and was ready to go around 8 a.m. Eastern time (5 a.m. Pacific), one person said. It was not clear if Tesla could maintain that level of production for a longer period of time. Money-losing Tesla has been burning through cash to produce the Model 3, and delays have also potentially compromised Tesla's first-to-market position for a midprice long-range battery electric car as a host of competitors prepare to launch rival vehicles. Production of the Model 3 has been plagued by a number of issues, including problems with an overreliance on automation on its assembly lines, battery issues and other bottlenecks. Musk wrote that not only did Tesla “factory gate” more than 5,000 Model 3s, it may make 6,000 Model 3s a week next month. Including Model S and X production, the company had a “7000 vehicle week,” he wrote. Not impressed was Steven Armstrong, Ford Motor Co.’s CEO for Europe, the Middle East and Africa. “7000 cars, circa 4 hours (heart) Ford Team (heart),” Armstrong wrote on his verified Twitter account, parodying a similar tweet from Musk about Tesla’s weekly output. Tesla regularly engages in so-called "burst builds," temporary periods of fast-as-possible production, which it uses to estimate how many cars it is capable of building over longer periods of time. Tesla said in May that its net Model 3 reservations -- accounting for new orders and cancellations -- exceeded 450,000 at the end of the first quarter. June was turbulent for Tesla. It laid off 9 percent of its workforce, endured at least two fires at its Fremont plant and accused a former employee of engaging in sabotage for speaking to the media. The ex-worker claims he is a whistleblower. In early June, Musk said it was "quite likely" that Tesla could deliver 5,000 Model 3s per week by the end of the quarter. At the time, Tesla was producing 3,500 of the vehicles per week, he said. As the end of June approached, workers told Reuters that the company was building fewer than its 5,000-per-week goal.